Arcadia Day Novels Blog Tour! I know I’ve been off the radar for the last five months, but I got to graduate school, and my life went crazy! I guess that’s what happens when you take too many course credits, start your research, AND have to teach two lab courses. Anyway, I’m back temporarily to host a stop on the Arcadia Day Novels blog tour! 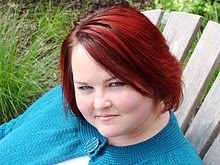 You may have read my mentions of my fabulous writing partner, Jesi Lea Ryan. 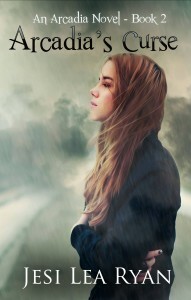 Last year she published the second book in her Arcadia Day trilogy, the story of a teenage girl who suffers a psychic break and becomes an empath when her twin sister dies in a devastating train accident. I’m sure you can imagine how dreadful it would be to feel the emotions of hundreds of teenagers every day! When I read Arcadia’s Gift I couldn’t put it down, despite the fact that I had been a beta reader. It’s so engaging! I just finished reading book 2, Arcadia’s Curse, and experienced a similar can’t-stop-reading effect. The plot slowly builds until the crazy hits the fan, and it’s impossible to stop yourself and get back to real life. I love these books, and I hope you will too! Below is the guest post written by Jesi Lea Ryan, and details about the Arcadia Day novels and where to purchase them follow. Enjoy! I am a read-a-holic. I know many people say that, but few book addictions run as deep as mine. Back in 2010, I tracked how many books I read, which turned out to be approximately 200 books that year. A very respectable number. But that got me thinking about how many more books I will likely be able to read in my remaining lifetime. At the end of that year, I turned 36 years old. If I live to 80, and assuming I don’t have some sort of health issue to prevent me, I will read another 8,800 books before I die. A lot for most people, but this number practically sent me into a panic attack. NOT EVEN TEN THOUSAND BOOKS LEFT!?! Crisis: There is no way I will ever get to everything I want to read. So after a little freak out which involved me crying over my to-be-read piles and cursing the myriad of paranormal authors who lured me into believing immortality might in fact be a viable option–all while my cat and husband looked on rolling their eyes at each other–I decided I needed to come up with a way to increase the volume of my reading. Yes, 200 books a year was no longer enough. The first step was evaluating my time. In addition to writing my own books and writing reviews, I have a full-time day job. Oh, and then there is my hubby who requires a little attention now and then. How would I ever fit more books into my schedule? The answer hit me when I was preparing to go on a long road trip by myself. I love music, but radio bores the heck out of me. The same five boy-band songs over and over hold no appeal for me. I usually end up listening to talk radio when driving around town, but on a road trip, you never know what crack-pot talk shows you’ll find. I ended up running over to the library and checking out some audio books. Audio books! Why didn’t I think of that earlier? Someone could read to me while I go about all the mundane tasks of my daily life. It’s the ultimate in multi-tasking! But dealing with the limited selection at the library and CDs was not going to work. And that’s when I discovered Audible. * I quickly learned that I could download books from Audible to my iPod or iPhone and take them with me everywhere. Now I listen to books in the car, while cleaning my house, doing my grocery shopping, working my job during the day, and drifting off to sleep at night. I now average about eight audio books a month which adds almost 100 books to my annual total. I suspect that I have probably decreased my traditional reading a little bit, so I estimate I am consuming about 250 – 275 books a year, bringing my remaining lifetime total to just over 10,000. I’ll take that for now. But when Amazon develops a brain implant chip to download books directly into your head–and you just know they are working on that as we speak–I plan to be the first in line. * DISCLAIMER: This is not a commercial for Audible, and no, I do not get paid to pimp them out. They just happen to be the service I use. iTunes and Podiobooks are also great options for downloading audio books. Thank you so much for having me on your blog today!!! It was my pleasure! And it has inspired me to get back to regular blogging! Everyone wins!